Kazimierz, the former Jewish Quarter, through the eyes of a local. I am fortunate enough to have a friend from Krakow. I really love to experience the city through the eyes of a local. This time was definitely no exception! Location: Kazimierz, the former Jewish Quarter. 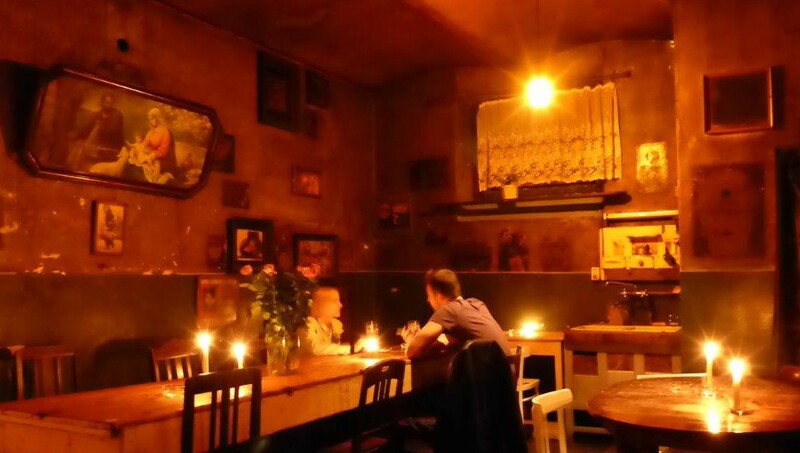 Said to be one of the coolest areas in Krakow, with many bars of different themes. First, we went to Komisariat, a bar made as a former police station. The interior included a wall for, and with, mug-shots, TV screens with old news broadcasts. On one was there is a sheet with the police stations opening hours (not very long…), but with the address of the nearest working police officer! A little food was needed before we went on. The polygonal house in the middle of the market square Plac Nowy, is known for the typical polish snack zapiekanka. It is kind of a mix between a half baguette and pizza. All of them serve more or less the same, but the queue in front of some makes it obvious that they are more popular than others. We ordered from the booth called Endzior, that the locals state have the best zapiekanka in Krakow. Even in the whole of Poland! 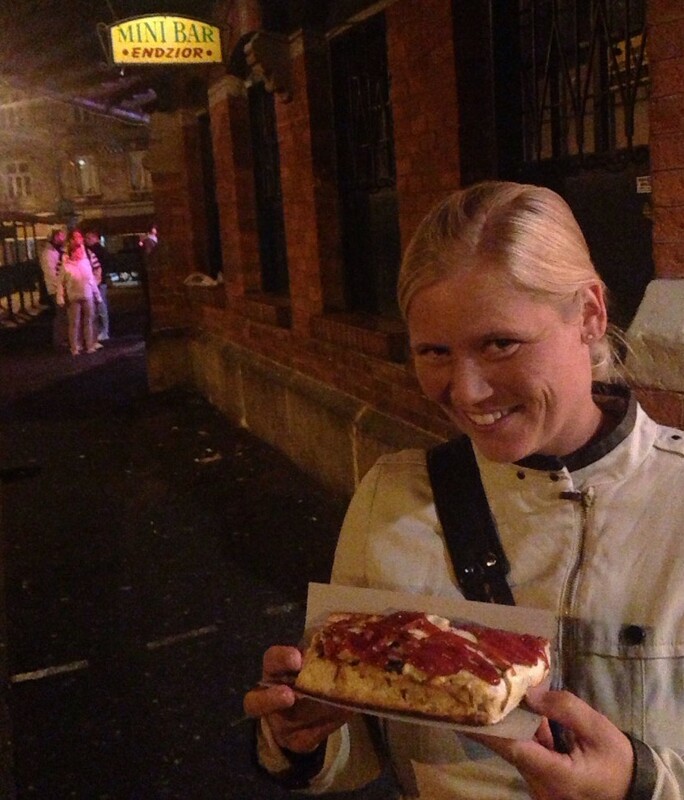 We chose to share one with peperoni and mountain cheese, actually from the Tatra area! Tasted very delicious! Enjoying the traditional snack zapiekanka. The second bar, Klub Piękny Pies, was situated in a side street to the main square. It has two different rooms, the one in the back often plays concerts. This bar is usually packed, but as it was Sunday it was quite quiet. But we enjoyed a few local Polish beers before we continued. A very interesting concept is small bars offering small meals and vodka. It is popular in post-soviet countries to drink a shot of pure vodka with some local snack. Very fascinated! One of them, Zakąski i wódka, was situated right by the market square, so we went there and ordered Bigos, soup/stew with meat and cabbage. And vodka, since that was the way to do it. Perfect bar snack! Zakaski literally mean “something to bite after”, or simply snack after a shot of vodka. It would be a great idea to go out for dinner just eating one dish at each place. There are many to choose from! Zakąski i wódka with a few pots in the corner for cooking. 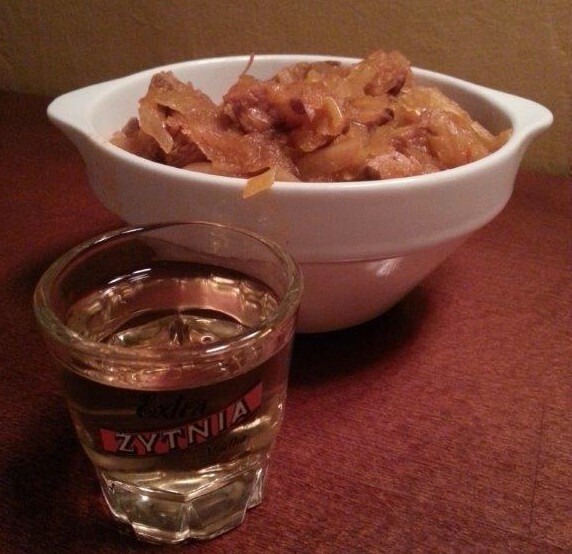 Bigos and vodka at Zakąski i wódka. 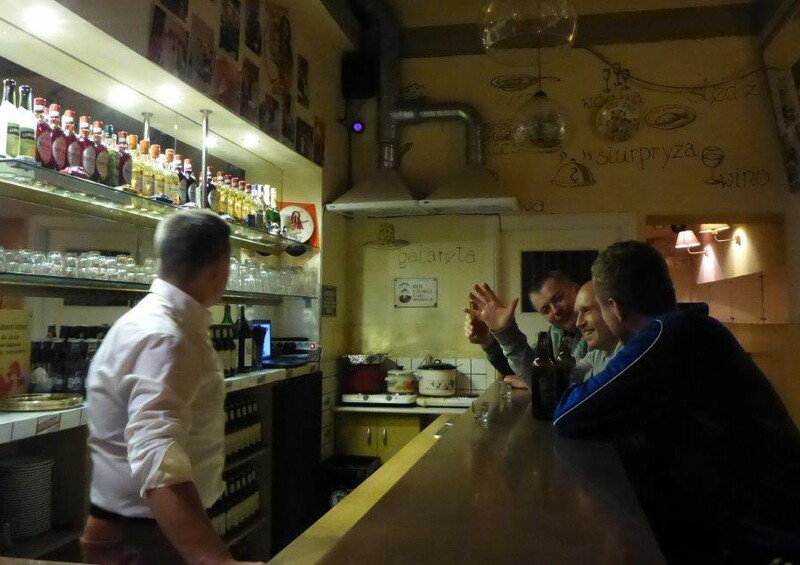 We also had a beer at Alchemia, one of the most popular bars in the area. 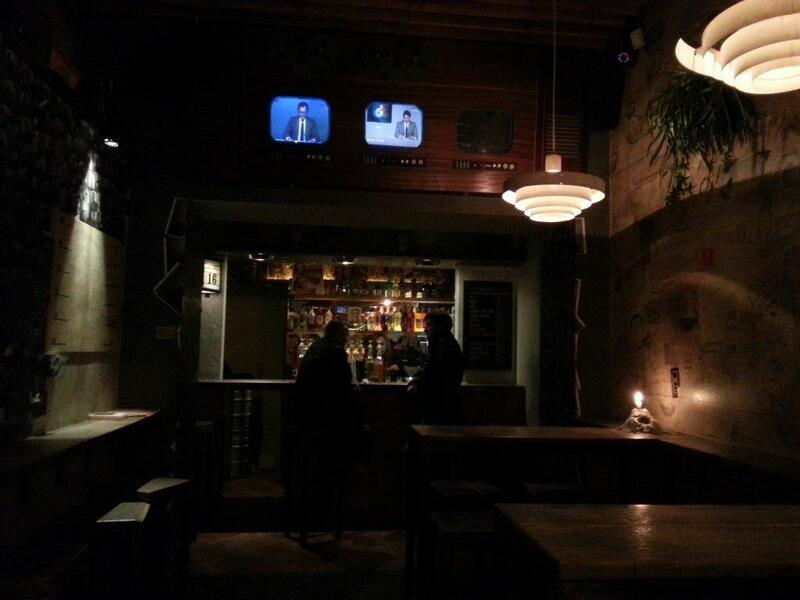 The bar has several rooms, decorated quite cozy with old-fashioned furniture. In the middle of the room, there was a large wardrobe, made as a door to the next room. Just like in the movie (and series) The Chronicles of Narnia. And the resemblance continues. Getting out on the other side, it was misty. In Lucy’s case in the movie, the mist came from the frost. In my case, it was smoke. The door lead to the smoking room. One of the rooms at Alchemia. Even though we walked from bar to bar, it was also time for some history. The Jewish Quarter Kazimierz is situated on an island and was originally granted from king Casimir III the Great (Kazimierz III Wielki in Polish) as a gratitude in the 1300s. During Holocaust, most of the Jews from the area were sent to Auschwitz, Birkenau or other concentration camps. The area still has a few synagogues, the only ones remaining in Krakow today. The fence in the park has obvious signs from the Jewish belief, shaped as many menorahs. Although this was a night out to enjoy, it was good to get some perspective and realize the area has a lot of history dating back to ancient times, wartime and also present time. Read my other posts from Poland and the road trip through Europe.